Everyone loves a sequel. Developers love a sequel, they can reuse an existing game engine and development times are reduced. Publishers love a sequel, they can tap into an established audience and already have a target in mind for promotion. Gamers too love a sequel, it's more of a game they loved, often with improvements. In a era before EA milked a franchise to within an inch of its life, it was Capcom who reigned sequel supreme. If something sold, you knew that within a year there would be a new iteration. The Street Fighter franchise is of course the most obvious, but even before then the Mega Man games had seen 7 games released within 6 years. In fact to date the series has sold over thirty million units worldwide, making it Capcom's most prolific franchise. Some of these games such as Mega Man 2 were the results of developers working in their own time to perfect a previous game that they weren't happy with. The majority though were the end result of a publisher keen to get cash from fans desperate for more Blue Bomber action. As someone who absolutely adores Mega Man games I am thrilled that at the time of their creation there was enough demand for regular releases. It means I have a back catalogue to enjoy now. For me the X series was Mega Man at its best, fantastic pixel art work, catchy memorable music, huge variety in level layout and style, creative boss fights and a punishing but fair difficulty. I was genuinely saddened that I finished Mega Man X as it meant I had no more to play. The price of its sequel being a reason, I thought, that I would never be able to play it outside of emulation. To have my hands on the game now is a thrilling thing. Often people criticise sequels for being more like modern day expansion packs, more like downloadable content. To me more of the same isn't a huge problem, if it’s more of something I like. Granted innovative ideas add freshness to a franchise, but deviate too far and there's a chance that the core audience will abandon a series. As long term Mega Man developer Keiji Inafune puts it, 'The nature of the creator is to constantly make something new, something different. However we understood that we couldn't go against everything that had come before'. Consequently, Mega Man X2 is more of the same. The central premise is identical to the 7 games that preceded this one: Mega Man must fight 8 robot bosses, using their skills against other bosses and then finally fight a final larger foe. Each level is themed around a robot master, and repeated plays of levels with acquired abilities allow X to find hidden upgrades and power ups. There are though a few tweaks to the franchise that are perhaps intended to make the game feel original. The cart has an onboard chip (the Cx4 chip) that does some fancy wire frame graphics, similar to what the Super Fx chip does. This adds nothing to the game, and unless you know in advance to look out for it you'd probably not notice. Two bosses and a title sequence really didn't justify the cost of the chip and every time a wireframe mesh appears it felt like a pointless gimmick to appease publishers. As lead designer Sho Tsuge notes "the Cx4 was our greatest adversary to date and yet we were told to use it in many ways as we could. We even used it in the letter 'X' of the title." Graphical gimmicks in particular are not needed in a game series that for me encapsulates the pinnacle of pixel art graphics. As with its predecessor the look is striking, vibrant and a perfect mix of flare and function. Others changes to the Mega Man formula in X2 however aid the game, not least a stronger narrative thrust and richer darker story. Mega Man X was primarily a story of growth. X after seeing Zero, aspires to become him. The rest of the game then revolves around him gaining skills to not only becomes his mentor but exceed him. 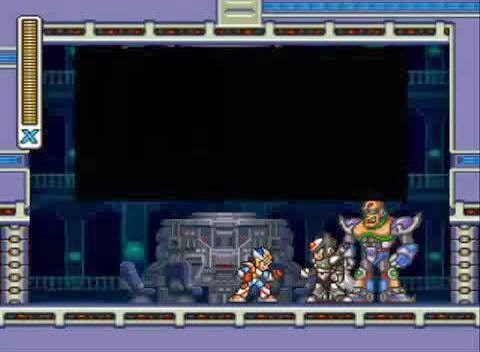 In Mega Man X2, X has become a hero leading an army, hunting maverick robots reploids. His efforts are magnified when three new antagonists called ‘The X Hunters’ taunt him with the remains of his fallen idol Zero, driving him to revenge. 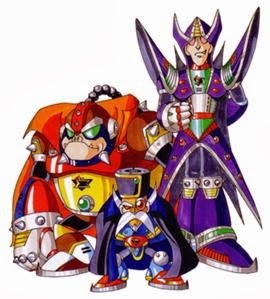 Appearing after you defeat any two robot masters, for me, much like a more complex narrative, the addition of these three bosses was a great idea. They can show up in any random stage in a hidden boss room. Defeat them and you get one of Zero's body parts and change the story outcome, ignore them and you get the bad ending. 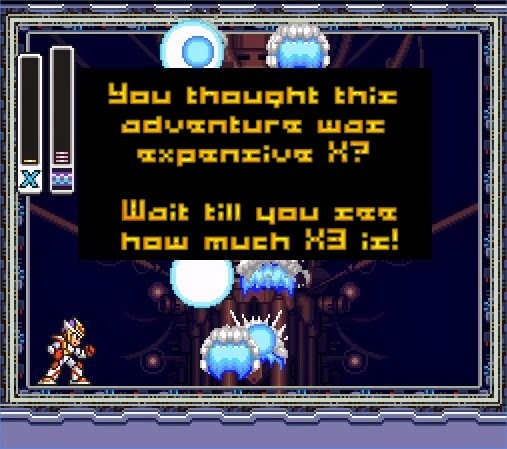 As they weren't tied to a specific stage, there was an element of random chance in X2 as the game may force you to approach a stage you may have been avoiding earlier than you desired. If you didn’t choose that level at that specific time there was no hope of saving Zero. It gave the game a greater challenge, forcing you to rethink the order you did things, forcing you to take risks. Previous Mega Man games may have been non linear in that you had a choice of which level to play. But in reality the fact that one robot master’s weapon is another robot master’s weakness meant that there would always be an ideal order to play the levels in. Having additional bosses move randomly between selectable stages finally made a series famed for a 'non linear approach' truly non linear. You didn’t have to take the three new bosses on at all of course. In my first play through I couldn't even find where they were hiding in all stages, meaning I actually missed the window of opportunity to destroy them. Not destroying them means the return of Zero in evil form, a boss battle at the end that really amps up the difficulty of the conclusion. Having to take on your former idol is the hardest challenge you face in the game, emphasising why its worth seeking out the ‘X Hunter’ bosses as and when they appear. Fighting Zero and then the standard end of game boss is astonishingly hard almost to the point of making the game impossible to finish without a fully upgraded protagonist. Essentially you have a choice; fight three extra bosses to avoid the impossibly hard challenge at the end, or level up X fully by making return trips to completed stages and finding all the health tanks and character upgrades. Either way the end result is that Mega Man X2 feel like the larger game than X1. A game that has more ways to complete it, multiple endings and better replay value. All of this however was a happy accident as Zero is included simply because he could be. Yoshihisa Tsuda recalls that 'Inafune came up to us one day saying 'Don't you think it'd be a shame to let Zero Stay Dead?' So we bought him back to life, it was that simple. We [brought] Zero back to life for no other reason than because we could'. In other places I wish more changes or improvements had been made over the prequel. It's still irritating that firing is limited to two directions, and instant spike deaths in an already hard game still seems brutally unfair. Some of the robot masters are less interesting than their equivalents in Mega Man X, but on the same logic some are much better so it's a case of taking the rough with the smooth. But, as with Mega Man X1, the main strengths over shadow the weaknesses, not least a step up in variety of level design over the first game. Levels are more platformy, more complex and many have quirks that just surprise the player. Wheel Gator's entire level for example takes place on a massive green tank that’s travelling through a city. Overdrive Ostrich's stage places X on a Hover bike, Morph Moth's stage has magnets that affect the stages gravity and Magna Centipede's level goes all out Metal Gear with a Heart Tank reward if you don't get caught by any search lights. This brilliant level variety is part due to the promotion Inafune from an artist in Mega Man X1, to the role of planning and producing X2. Inafune’s more central role in the project meant this resurrection of Zero (a character he had designed to actually be the lead in Mega Man X) and ‘[he] bought original revolutionary thinking back to the series’, according to lead designer Tsuda. Mega Man X2 does illustrate how some fresh blood and fresh levels ideas if used sparingly can really keep a player engaged and on their toes. How a sequel can be true to its roots, yet still surprise without alienating the core fan base. It's difficult to pick a favourite between X & X2, which is saying a lot when you consider how much I liked the first. It sounds just as good (even though X2 had one composer compared to X1's five) and looks of par if you ignore the wire frame nonsense. It's perhaps slightly easier than the first, but that may be because I had honed the skills required to succeed in the follow up by completing the predecessor. Yes, it may be more of the same but how can that ever be a bad thing when Mega Man X is one of my favourite ever Snes games. How did I end up with this game? Do you rememberwhen I spent more money on a standard edition of game than I ever had before?So racked with guilt was I after my self indulgence, I wrote a blog about spending so much. Mega Man X2 was the game I splurged on. The problem is MegaMan X3 is even more expensive. Now I have two thirds of a set I am going to have about as much trouble resisting buying it as I will justifying it!